READY TO LIVE THE GOOD LIFE: 3 years old / 28 lbs. and needs to gain a lot more weight Mostly Mutts adoption center is open Mon-Sat. 11-4pm. Some of us are in foster homes so please call 770-272-6888 1st to find out if I’m available to meet during the week. Hi there! My name is Lula Mae! I am a sweet girl who is a bit timid and shy, but my wagging tail in the midst of my fear tells everyone I really want to love and be loved. The volunteers feel I may have spent most of my time in an outdoor kennel without much attention or affection, so I am learning to trust that people can be kind and loving towards me. Normal household noises will likely frighten me at first, but I will be brave and learn that they are normal. In fact, in my temporary foster home, my hosts were impressed with how well I handled living indoors for the first time. I even had pretty good potty manners, with just a few accidents. I bonded with my foster mom more deeply, but I loved my foster dad too! They also discovered a little quirk of mine – I would only drink out of the water bowl when it was in the crate. I came to Mostly Mutts extremely thin, but I’ve almost gained what I need to return to a healthy weight. My daily walks are a highlight of my day, and I have good leash manners, so you will enjoy our walks, too! I have had good potty manners on the shelter schedule, so hopefully that will be the case in my new home too. 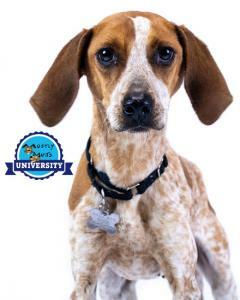 I’m a student in the Mostly Mutts University training program, and I’m learning lots of great doggie skills. So far, I’ve mastered the ‘sit’, ‘come’, and ‘go to your place’ commands, and on top of that, working with my trainer is helping me to come out of my shell more and experience the love I so deserve. I’m strongly food-motivated, so it’s no surprise that I enjoy training and am quickly becoming a star student! Check back soon to see all the things I am learning! My innate love of people was evident when – during my photo session, I seemed fearful of the camera but when a volunteer came in to comfort me, I wanted nothing more than to snuggle and give her kisses. I came in with other dogs and I met some of the other mutts at the MM facility and did well with them. I did growl at one puppy (perhaps it had too much energy for me? ), and I started curling my lip at the dog in my temp. foster home, so if you have another dog, let’s meet to make sure our personalities mesh. MM’s does think that in time, another nice dog may help me grow in my confidence. I was very scared when my trainer tried to introduce me to two kids (11 and 7 years old) at MM’s, and I wouldn’t go near them. I’m scared when I meet new people in general, so maybe in time I will feel more comfortable around children, but for now a home without kids is best for me. Come meet me and see what a loving companion I can be! Energy level: 4-6 (may increase as I grow more confident and comfortable, as well as getting closer to my healthy weight). I'm current on vaccinations, micro-chipped, spayed, and my adoption fee is $299.00 which also includes an engraved name tag, Martingale collar and leash.